Fans propped up on a stand, called either pedestal fans or stand fans, are convenient when it gets hot. The pedestal fan is also placed on the floor, but it has a four-legged base (the “pedestal”) and a telescopic tube to vary the height. The height usually can vary between 15-48 inches. The fan blades are placed on the telescopic tube. They usually have a number of speeds, and have a button to allow them to swivel. That way, you can manage to cool off an entire room. But there are several models of stand fans. What are the factors to help you decide which to buy? 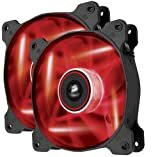 Here is a guide to some of the best stand fans on the market. Manual control: These fans will have a set of buttons or knobs to adjust the speed, and to allow the head to oscillate. 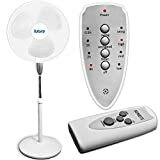 Remote control: Lasko makes a series of stand fans that work on remote control, as well as the standard manual control. Besides the on/off power button, the remote control unit has 1) a fan speed button, which can alternate between Low, Medium, and High, 2) an oscillation button, 3) a timer button, which can operate the fan from anywhere between ½ hour to 7.5 hours, in increments of a ½ hour, and continuous, and 4) a sleep button, which puts the unit on Low speed for 6 hours. Industrial Fan: These will be very powerful, being able to circulate air through an entire warehouse. 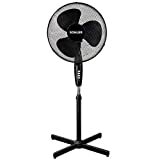 For example, the Gizmo Supply Company's 20” Oscillating Pedestal Industrial Fan is on a 5-foot tall pedestal, and can move air up to 8,300 cubic feet per minute. 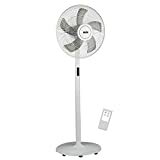 The Air King 9175 30” Industrial Grade Oscillating Fan is 30” in diameter, and can be used to cool off a very large area, like a warehouse or barn. Misting Fans: There are stand fans that scatter a spray of water, while circulating the air around you. This can cool you off even more. This model is especially useful at summertime outdoors events where air conditioning is not practical. What diameter fan: The diameter of the fan blades will determine how well they circulate the air. Customers prefer the 18” over the 16” fans—they feel that it moves the air much more efficiently. Easy assembly: Stand fans will involve some assembly of the pedestal tube and base. Typically it should take no more than 15-30 minutes, and should not require any special tools. Also, taking the unit apart to save space should be simple—but some manufacturers have convenience in mind. For example, the Comfort Zone CZST161BTE Pedestal Fan has a special base that can be folded. That saves you the trouble of disassembling the entire fan when the summer months are over. Number of blades: Fans can have from 3 to 5 blades. The more blades means that it chops and oscillates the air better. Energy consumption: The Gizmo Supply industrial fan uses a lot of power: 285 Watts. But that's for cooling off a very large area. If you're more conservation-minded, you could try the Vornado 6803DC Energy Smart Circulator, which is 80% more energy efficient. It uses a AC/DC transformer, so it uses only 60 Watts of power. Adjustable Speeds: Most of the portable fans have only three speeds. The speeds are rated in revolutions per minute (=rpm). In one model, for example, the slow speed is 900 rpm, medium is 1100 rpm, and high is 1280 rpm. 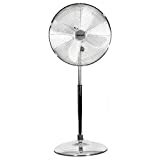 But some pedestal fans can have as many as 10 different speeds. The Vornado 6803DC has a digital control, where you can type in any speed from 1-99! Adjustable height: Pay attention to the variable height of the stand fan. The Vornado 6803DC can vary from 31-39 inches in height. 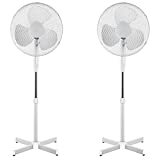 Oscillating Fans: These fans have an option to swivel back and forth, changing the direction of the air flow. Fans vary as to what angle they oscillate: Most have a tilt-back head, and some fans swivel as well. Some swivel through a 90-degree angle, some through a 180-degree angle, and some even circulate the air full-circle, through 360 degrees! Method of oscillation: They can operate by mechanically rotating the head of the fan, or by moving a set of louvers that direct the airflow. This helps the air circulate better in the room. Rowenta: was founded by Robert Weintraud in Offenbach, Germany in 1884 under the name Weintraud & Co. He first started manufacturing office supplies, lamps and clocks. In 1909, he shortened the company name to Rowenta. They make all sorts of household appliances: irons, vacuum cleaners, heaters, humidifiers and fans. Lasko: was founded by Mr. Henry Lasko in 1906 in Philadelphia, Pennsylvania. He first started manufacturing metal products, but then he expanded into small appliances, fans and household portable heaters. Comfort Zone: has been making heaters, fans, and humidifiers since 2006. 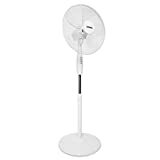 Their fans include personal fans, table fans, pedestal fans, tower fans, window fans, box fans and wall mounted fans. 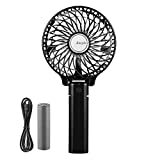 Their stand fan has a folding base, so as to save space when you want the fan out of the way. Deco Breeze: is a branch of the company Global Product Resources, Inc., specializing in creative consumer products. They were founded in 2005, and are based in San Diego. Deco Breeze is the branch of the company that makes decorative floor and table top fans. Vornado: are makers of air circulators, heaters, air purifiers, humidifiers, and steamers. They were started by Ralph K. Odor and Ottis A. Sutton in 1945 in Andover, Kansas, when they started trying to optimize airplane propellers—they realized that the same design could be used for household fans. 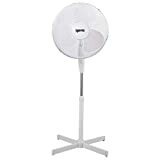 They make compact table fans, as well as tower and pedestal fans.